1. Applicant must be at least 18 years old: This NFPT requirement assures that the applicant, choosing to enter into agreement with the NFPT certification program, is a recognized legal adult. A legal adult, or individual over the age of 18, is legally accountable for their actions and at the legal age to enter into enforceable agreements. NFPT applicants enter into agreement with NFPT. 2. Applicant must have high school education or equivalent: This NFPT requirement assures that the applicant has completed the academic education which is federally mandated and required for high school grading qualification achievement. The completion of a high school education diploma or general education degree (GED) demonstrates the applicant’s minimum competency in subjects relatable to the foundational knowledge that is required for personal trainer specific skills. These subjects include: Math, Science, English and Physical Education/Health. 3. Applicant must agree to adhere to the NFPT Codes of Conduct: This requirement assures that applicant understands his/her obligation to adhere to professional ethics and safety standards before, during and after the pursuit of the personal trainer certification qualification. In addition, Applicants, Test Candidates and Certificants must report any conviction of a felony. This must be reported to the Human Resources Director at [email protected]. Reports of felonies will be reviewed under the disciplinary and complaints policy, on a case by case basis. Felony offenses which have occurred within seven (7) years before application submission and are grounds for applicant ineligibility will include, but are not limited to, all sexually based crimes and/or the intent or actual use of a weapon to cause or threaten harm to another person. Felony offenses which have occurred seven (7) or more years prior to application submission will be reviewed on a case by case basis, with an eligibility decision that is at the sole discretion of NFPT Certification. Felony offenses which occur after application eligibility or certification award and are grounds for applicant ineligibility or certification revocation include, but are not limited to, all sexually based crimes and/or the intent or actual use of a weapon to cause or threaten harm to another person and/or the involvement in the illegal use, sale, or distribution of anabolic or controlled substances. Investigation and disciplinary action will occur in compliance with the Certification Council’s Discipline and Complaints policy. SEE ALL POLICY AND PROCEDURE RELATED TO THE CERTIFICATION PROGRAM AND RECERTIFICATION REQUIREMENTS IN THE CERTIFICATION HANDBOOK. When applying to the NFPT Personal Trainer Certification Program, you are agreeing that you have read and understand the policy provisions of the NFPT Personal Trainer Certification Handbook which defines certification application eligibility, refund requests, test administration and responsibilities, membership renewal and recertification requirements, professional standards for codes of conduct and subsequent disciplinary action and all other statements and disclosures of the NFPT Personal Trainer Certification Handbook. The NFPT has adopted a scheduled refund policy for certification packages and the NFPT-CPT exam voucher that allows a full refund minus a $50 processing fee within the first two weeks of the original application. This refund amount decreases by 25% with every two week period with no refund provided at the end of 8 weeks. If the test candidate schedules the exam appointment, prior to requesting a refund, an additional $35 service fee will apply. The NFPT Membership Renewal Fee and NFPT-CPT Exam Re-Test Fee is NON-REFUNDABLE. For NFPT Advanced Continuing Education Courses NFPT has adopted a scheduled refund policy that allows a full refund minus a $25 processing fee within the first two weeks of the original application. This refund amount decreases by 25% with every two week period with no refund provided at the end of 8 weeks. No refund is provided for NFPT Introductory Continuing Education Courses. No refund is provided for any course (CPT or Continuing Education Courses) if the exam for the respective course has been taken, regardless of passing or failing score, no refund is provided after test sitting. Herein are the terms and conditions for the use of the title NFPT Certified Personal Trainer, or NFPT-CPT. Certified Personal Trainer, CPT, is the generally stated title and accompanying acronym that is most commonly used in the personal fitness training industry for an individual who has been appropriately assessed and who has successfully demonstrated necessary skill sets of the certified personal trainer by a national certifiying body. After becoming certified by NFPT, through NFPT certification examination assessment, the specific title “NFPT-CPT” or “NFPT Certified Personal Trainer” is used to identify the industry designation with the NFPT specific certification distinction. A NFPT Certified Personal Trainer certification is issued to an individual who has met all eligibility requirements and has successfully completed the certification examination approved by NFPT Certification. To distinguish the industry title from the various organizations who provide personal trainer certification, identify your certification as being completed through National Federation of Professional Trainers, NFPT. A job title, issued by an employer, may be different than this NFPT-CPT distinction. This professional distinction, NFPT Certified Personal Trainer, may be used to accompany a job title that has been issued by an employer. The NFPT-CPT designation is an abbreviation of the full professional title as it relates to the organization from which you received this distinction. These titles are not protected under law as personal fitness trainer certification is an industry-regulated credentialing profession; however, the assessment that is used to issue this professional NFPT-CPT distinction is a legally defensible assessment upheld as a viable and protected assessment for the award of the credential. All active NFPT-CPT’s, are included in the online personal trainer database at www.nfpt.com/trainers. Only the NFPT Certified Personal Trainer’s name, city, state and zip/postal code will be provided to the public when accessing this database (all other NFPT-CPT information is deemed private and confidential). NFPT-CPTs have the option to add additional personal or other information to his/her online database listing. This listing is available to the public in an effort to provide for consumer safety and regulation of the use of this NFPT-CPT title. The NFPT-CPT database allows potential clients and/or employers to verify the certification status of the NFPT – CPT. 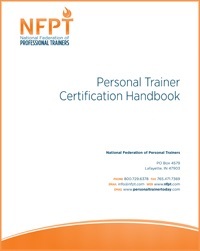 Upon a NFPT-CPT’s inactive status, followed by the expiration of the certification that arises from lack of continuing education credits and/or renewal fee payment, the database listing is removed and the individual must immediately remove and refrain from the use of the NFPT-CPT designation and Certified Personal Trainer professional title, or other combinations thereof which reflect a current/active personal trainer certification status. An inactive certificant may not engage in activities of a NFPT Certified Personal Trainer, nor make publicly or privately available the title NFPT-CPT or any variation thereof which indicates or implies an active/current NFPT Certified Personal Trainer status. A violation of these terms will be pursued in accordance with the disciplinary actions available to the NFPT Certification Council described in the NFPT Personal Trainer Certification Handbook. Herein are the conditions for the use of the NFPT Certification Logo/Mark (referred to as the ‘NFPT Branding’). Copyright 2011. All rights reserved. These guidelines have been created by NFPT Certification to ensure consistency in the manner by which the NFPT Branding is used and displayed. NFPT Branding may refer to the NFPT Certification Mark, the NFPT logo, NFPT Certification Badge, or any other representation of NFPT Certification status which identifies yourself as an active NFPT Certificant. Unless otherwise expressed in writing and in accordance with agreements made by and between NFPT partners, the NFPT Branding can only be used by individuals who are currently certified by the National Federation of Professional Trainers, NFPT Inc.
1.1. By using NFPT Branding, you acknowledge having read and understood these conditions of use and the disciplinary actions for misuse of NFPT’s intellectual property. Disciplinary action may include eligibility status or certification status revocation and/or action taken by NFPT Certification in accordance with intellectual property rights governed by the laws of the state of Indiana. Accordingly, you agree to abide by these conditions as well as any future modifications which may be made. These conditions of use represent an agreement between you and NFPT. 1.2. These conditions of use may be subject to change, addition or deletion at any time. Any such change will be posted on this page and/or you will be notified directly. 1.3. If you do not agree to be bound by these conditions of use, you should not use NFPT Branding. 2.1. Use of NFPT Branding is only permitted for as long as you are currently/actively certified. The removal of all NFPT Branding must take place immediately following your certification expiration date, if your certification has not been renewed. 2.2. As an active/current NFPT certificant, you may use language such as ‘NFPT Certified Personal Trainer’, ‘I have been a NFPT certified personal trainer since ______ ‘, ‘I am a NFPT Certified Personal Trainer’. Do not use language which implies that your company, staff or other related persons or services are ‘certified by NFPT’ or ‘accredited by NFPT’. No language which speaks to ‘Accreditation’ as it relates to your NFPT certification or NFPT company or service affiliation is permitted. 2.3. You are only permitted to use the NFPT company logo in the format that NFPT provides it. The NFPT Certification Badge is available as a download or HTML code format only through your NFPT secure online account. It may not be copied from NFPT or other online sources. It may not be broken up, retouched or in any way manipulated that alters, skews or distorts the proportions, integrity or value of NFPT Branding or the individual components comprised of NFPT Branding. 2.4. NFPT Branding may be displayed in combination with trainer or company specific other proprietary marks or logos as long as this is done in a way which does not confuse the public display of such marks. There must be a clear distinction between your services and NFPT Certification. In no way should NFPT Branding be misleading or convey a message of false advertising or endorsement by NFPT Certification. Do not integrate the NFPT Branding with any trainer or company specific mark or logo that creates an impression of one single mark.